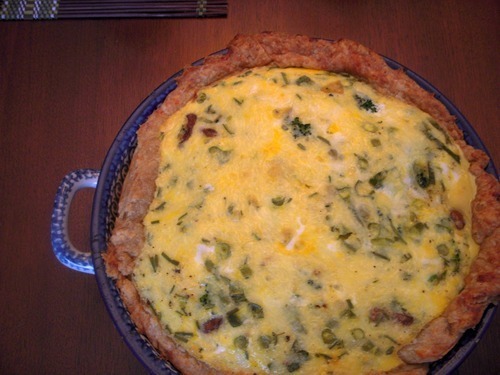 We had a couple of cheddar crusts left over from our cooking adventures at Selma Cafe, and we decided to use one to make a quiche for a team lunch last week. Cara’s lovely quiche dish was quite deep, so our cheddar-crusted quiche was packed with a full dozen eggs from Sunrise Poultry and loads of veggie goodness, like broccoli, onions, garlic, and mushrooms from Tantre Farm, pickled green beans from our pickling party, herbs from Karl and Cara’s garden, and yes, more cheddar cheese! It was so good, I wish I could have another slice right now…. This entry was posted in In the Kitchen (recipes & more) and tagged farmer's market, lindsay jean hard, local farms, local food, Real Time Farms, Selma Cafe. Bookmark the permalink.